The Adventures of Terka & Jeffko: Help! Bratislava is being eaten alive by billboards! Help! 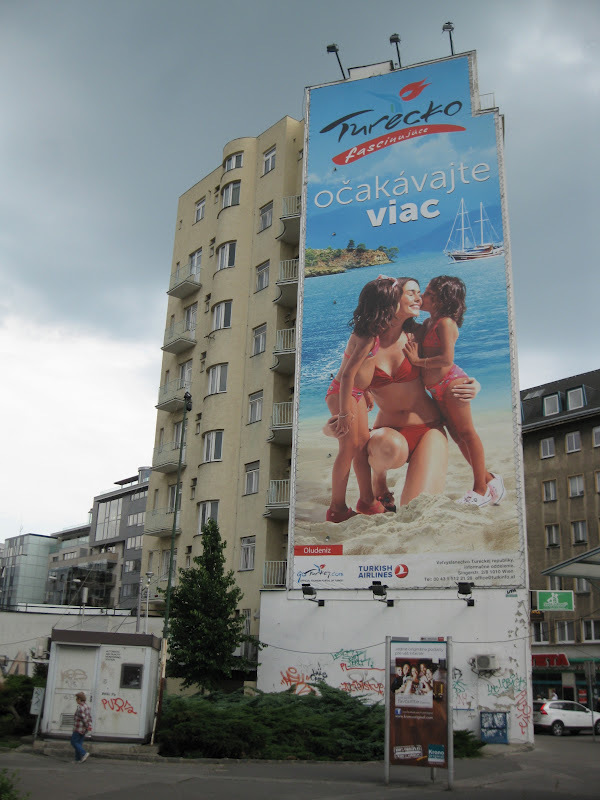 Bratislava is being eaten alive by billboards! 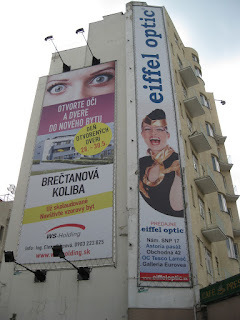 It's true - Bratislava (well, the whole country, really) is suffering from an explosion of billboards. People find highly imaginative and invasive ways to squeeze billboards and large banner-style ads onto any space available. Some of them are even thrown right over large sections of the facades of buildings, directly over the windows, obscuring the views of the poor folks inside and cheapening the structures they cover. Walk anywhere just outside Bratislava's historical center and you'll be assaulted by eye-level billboards covering every inch of fencing around green spaces, vacant lots, and parking lots; massive banner ads stretched over both residential and commercial buildings; and large, fairly low-sitting billboards cluttering stretches of major roads at intervals of 100 feet or less. Many sidewalks and pedestrianized passageways are similarly encrusted in loud, bright, garish billboards. It's an unrelenting onslaught of advertising that's gotten way out of control. Billboards line this stretch of the otherwise nice Postova, a pedestrianized street that runs from Hodzovo namestie to SNP namestie. I've read that even 10 years ago the situation wasn't so dire; that it was more in the last decade when people realized they could make a killing by renting billboard space. And they took to it with gusto, apparently with very little regulation. I suspect it's a symptom of the "turbo-capitalism" that gripped the nation (and much of central Europe) in the aftermath of communism's demise. Many of the former Eastern Bloc countries lunged toward capitalism in an attempt to catch up with the West and reap all of the supposed benefits. But in doing so, regulation often went out the window. Sadly, the result is that we are bombarded at nearly every turn by loud, ugly, jarring billboard advertising that clutters the urban landscape. Luckily, you don't really see billboards in the historical center, but you have only to walk a few feet beyond the center's original medieval boundary to be suddenly surrounded by them. This banner ad is on the side of a historical building just below the castle, technically a historical area. It overlooks the freeway coming off the UFO Bridge. Another common sight in Bratislava. People cram billboards/banner ads into any available space. This building is across the street from SNP Namestie, a popular square used for important events that lies just outside the medieval historical center. No doubt, it's an ugly building, but these massive and hideous banner ads do not help! 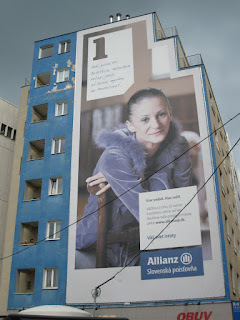 Colossal banner ad on the side of an apartment building in Kamenne Namestie, right outside the historical center. When the facade of St. Martins cathedral was getting a facelift, the scaffolding around its tower and steeple was covered by large, hideous advertisements. Contrast that with Siena or Florence, Italy, where when the major cathedrals there had their facades scrubbed, life-size, color graphics of the facades were stretched over the scaffolding so that people could at least have an idea of what was being restored behind the cladding. Now, I totally get that in some cases (perhaps including St. Martins), the advertising on the scaffolding is likely what's funding these typically costly restorations. It's ugly as sin, but preserving historical structures is a good cause, and besides, it's temporary. St. Martins, as nice as it is, just doesn't have the stature or draw of, say, Siena's Duomo, so it probably has to look to other alternatives to fund its restorations. However, a bastion along the medieval wall just up from the St Martins has been encased in scaffolding and covered in tacky, oversized ads for the last couple of years. Yet, it doesn't look like any work has been done on the bastion. Apparently, the company responsible threw up the scaffolding, rented out the ad space, and just left it. Was the city suddenly unable to pay for the restoration project, so they left it on hold in a state of billboard limbo until they could cough up the dough to complete the job? Regardless, it's unfortunate that there is not some other alternative. I'd really like to know more about how renovations of historical structures are funded, both in Slovakia and across the EU in general. Having to rely on/resort to billboards, especially for major historical sights in an EU capital, is sad. Billboards on the medieval bastion. One of the most egregious examples of unchecked billboard insanity can be seen along the Devinska cesta highway between Bratislava and Devin. This stretch of road traverses a scenic natural setting filled with lush foliage, and runs alongside a tree-lined canal that splinters off from the Danube. Yet, the canal side of the highway is littered with large, tacky billboards that sit a little above eye-level and appear about every 100 feet! What a way to cheapen an otherwise lovely road! I was thoroughly shocked to see photos of communist-era landmark Hotel Kyjev from about four years ago when its western (and most visible) side was completely covered by a colossal banner style advertisement. (Check it out). Obviously, Hotel Kyjev ain't Brunelleschi's Duomo, but still, it's inconceivable to me that a city could allow this kind of thing, particularly on a building that's increasingly valued for its architecture and history (not to mention, I feel sorry for any patrons thinking they'd get a nice 12th floor view over the city). Seriously, whoever allowed this to happen should be publicly humiliated by being forced to spend the rest of his or her life as a human billboard. Anyhow, you can imagine my excitement when I stumbled upon this article, according to which Renáta Zmajkovičová, a deputy speaker of parliament, is calling for laws to limit Slovakia's crazy, out-of-control billboards. According to this article, "Zmajkovičová feels the time is right to deal with the issue of roadside advertising, and to examine also how billboards are changing the face of the countryside and towns. Saying Slovakia has more billboards than trees, she feels that the municipal architect should have a say on the placement of billboards and other advertising as it changes the character of towns." Granted, this is an ugly new building, but it does happen to sit directly across the street from the Danube embankment. Any other city would understand that placing colossal banner ads along the riverfront is a bad idea. I really don't think you would see this along the downtown riverfronts of Budapest or Prague. Of course, what's shocking about this (and yet, kind of not) is that this article implicitly states that Slovakia currently has zero billboard regulation. 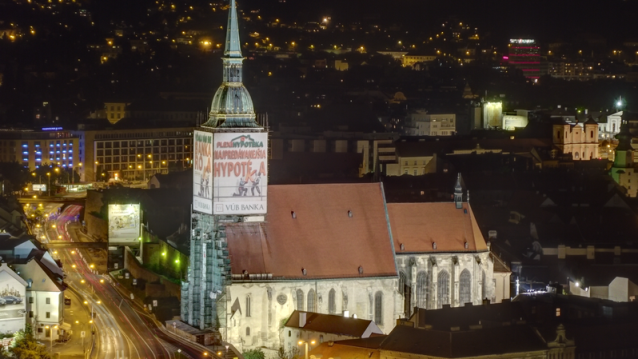 Some of Slovakia's neighbors, like Austria and Italy for example, have strict regulations regarding where billboards can be placed, as well as how large and how brightly lit they can be. But apparently Slovakia did not get the meme. I wish Zmajkovičová all the luck in the world, because she's going to need it. Lobbyists will be unrelenting and ruthless when opposing her proposals, because, as is stated in the article, billboards have become an extremely lucrative business. But I'm happy to see that there are elected officials who at least recognize that there is a serious problem and that it really does cheapen Slovakia's scenery. In a Europe where economies rely increasingly on foreign tourism, keeping tacky billboards to a minimum is a good idea. Obviously, you've got to strike a balance between inviting new business opportunities and preserving the qualities in one's country that attract visitors in the first place. I hope Slovakia can learn how to do this. If not, I guarantee the onslaught of hideous ads will only help cement Slovakia's status as a mere "day-trip" destination for those passing through to its neighbors. You gotta love how the image has to be cut so as to conform to the "steps" in the upper righthand corner. Must sell every inch of space! A billboard on the pedestrian path along the right bank of the Danube. Is this what you'd like to see on your leisurely stroll along the Danube? Even the Manderla building's got one. This is the billboard that was knocked down by a nasty gust of wind and came within inches of hitting a woman who was walking by. Oh dear, I recognize so many of those billboards! It's true, the billboards ARE out of control. However, I must admit I found that enormous LIFE CAN BE BETTER banner to be a marked graphic improvement on the faceless 20th century blocks that line the Danube. I can imagine a guerrilla graffiti artist changing the "shoes" to "Jews" to make an ironic statement about what happened to the Jewish quarter (which was of course, located there where the freeway now is) and its inhabitants. Job update: Terka found one!